With an eclectic combination of a playful, vibrant and classic Mid-century modern style. This home doesn’t disappoint. You can find something great in every room. We really enjoyed getting to know Anna and were welcomed into her home in Putney with open arms. On entering the room, you immediately feel comfortable and welcomed by the scented candle filling the room with a beautiful aroma. The mid tones on the walls and exposed wooden flooring complementing the vibrant pink chairs giving the room that pop of colour and texture. Our Shutters are the finishing touch to the room, adding security for the family. 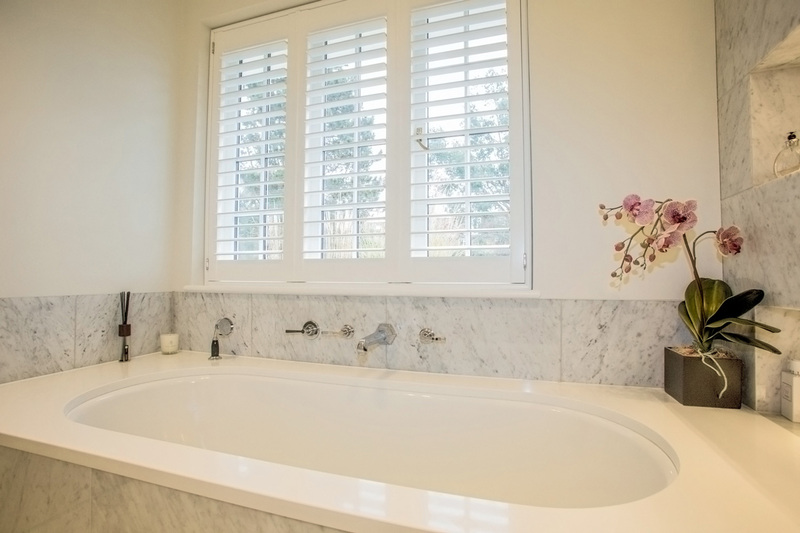 The Pearlwood, Full Height shutters are perfect for privacy but also allows for natural light to enter the room. The custom colour of these shutters chosen to fit in with the colouring of the home. Shutters are an excellent alternative to curtains- acting as a window covering without adding unnecessary clutter to the room. The mid-century contemporary style comes out in the bathroom with most of the walls covered in floor to ceiling neutral textured tiles. By having neutral colours, it allows the mind to stay calm and relax creating a sanctuary in the home and that is exactly what our clients wanted in their bathroom. They opted for out Permawood shutters as they are a waterproof material and perfect for a bathroom. They are extremely hardwearing and lightweight which is especially important for a bathroom with the bath right by the window, and with children, there will likely be a bit of splashing. Unlike lesser vinyl products on the market, the profits of the frames are far more refined, stylish and elegant. Upon entering this elegant country modern styled room, you can instantly see that it is the perfect place to escape to at the end of the day. 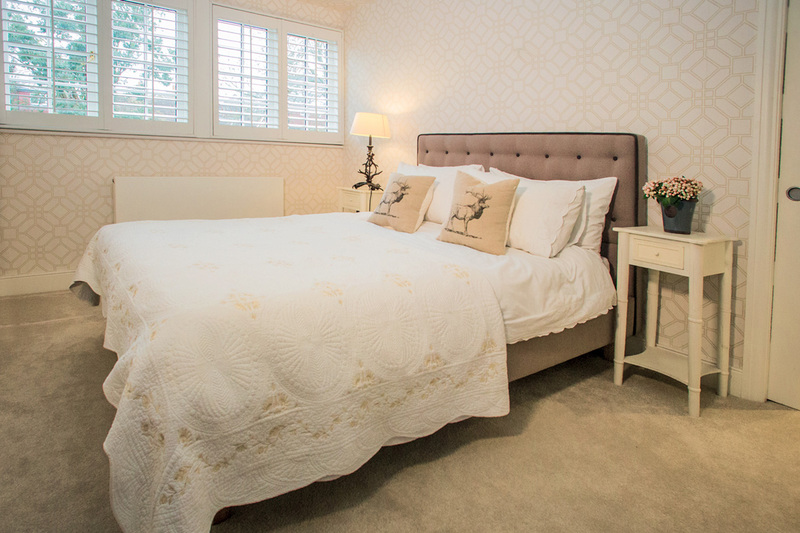 The soft colour scheme and cosy fabrics bring an element of serenity to this room. Having a minimalistic and uncluttered room makes the perfect environment for a good night’s sleep. Much like the other rooms, our shutters also add to the uncluttered clean look and provide added darkness at night and you can control the natural light during the day. Ruby Pink for their daughter’s room and Royal Blue for their son’s room gives each room a personal touch from each child. As children spend most of their time in their rooms, it was important for our clients to have a separate fun and cosy space for their children call their own and love. And having shutters in their rooms adds that added warmth and privacy for the children, allowing them to get a good night’s sleep and ready for the next day. Our client's shutters are Pearlwood and Permawood which provide a contemporary and clean feel to their home and opted for 76mm slat size which is incredibly stylish. In terms of material, our clients chose to have Pearlwood throughout the different rooms except they chose our waterproof Permawood for the bathroom. They wanted a lightweight wood the would be durable and could have a custom colour to fit with the colour scheme of their home seamlessly. Also, the fact that it has a paint finish on both the shutters and the framing was a deciding factor for the family. 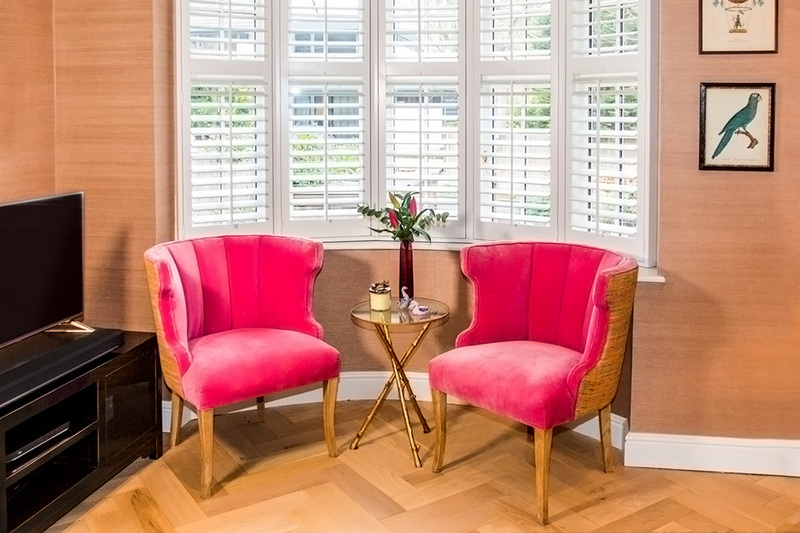 Plantation Shutters are the perfect choice for any busy family looking to add a stylish and new touch to their home. They are durable, easy to maintain, offer privacy, light control and perfectly adaptable for your family requirements. For all your plantation shutter queries please call us now on 020 8871 9222 or email our friendly team today.